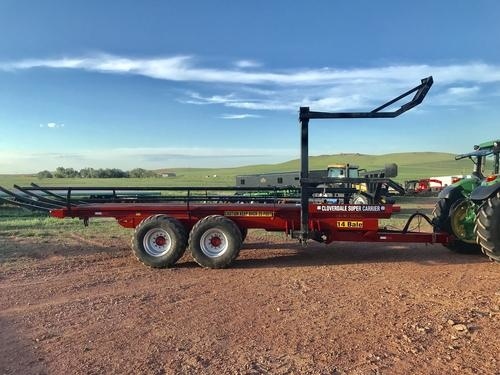 Heavy duty trailer hauls 12 -5 ft wide or 14-4 ft wide bales. 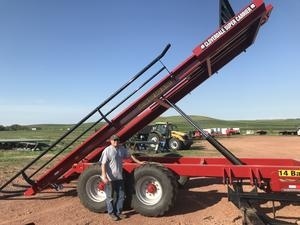 Will 1/4 turn bales for ease of loading bales anywhere in the field. Simple to operate. Load two bales with the loading arm and the pushback bar slides the load back making room for the next two bales. To empty trailer the deck lifts up and bales slide off. No chains or cables. 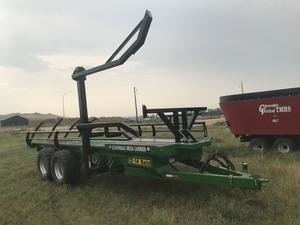 Requires 3 hydraulic remotes and if you dont have 3 hydraulic splitters are available. . Will handle wet or dry bales from 4 ft up to 6 ft 6 inch diameter. 50 inch deck height for clearance on rough terrain. Weighs 12,440 lbs. Heavy duty walking tandems and flotation tires.